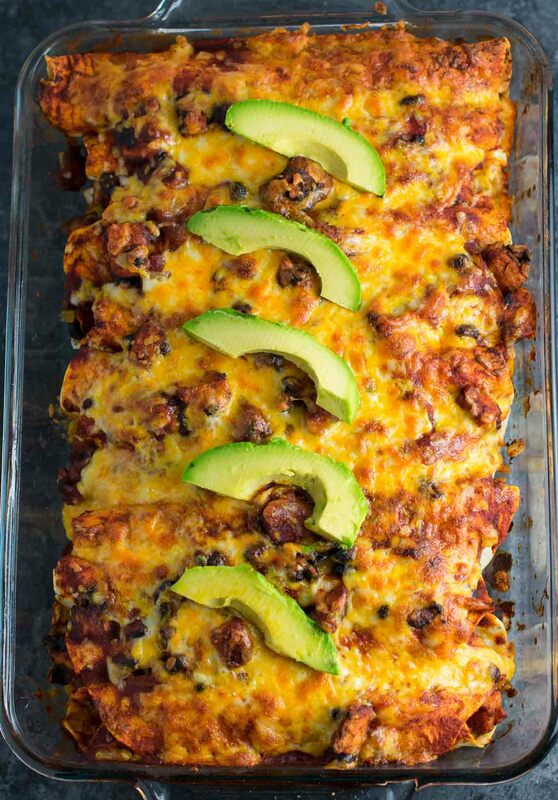 Y’all know how much I love my first enchilada recipe that I posted to my blog. It has gotten rave reviews and is so simple to make. 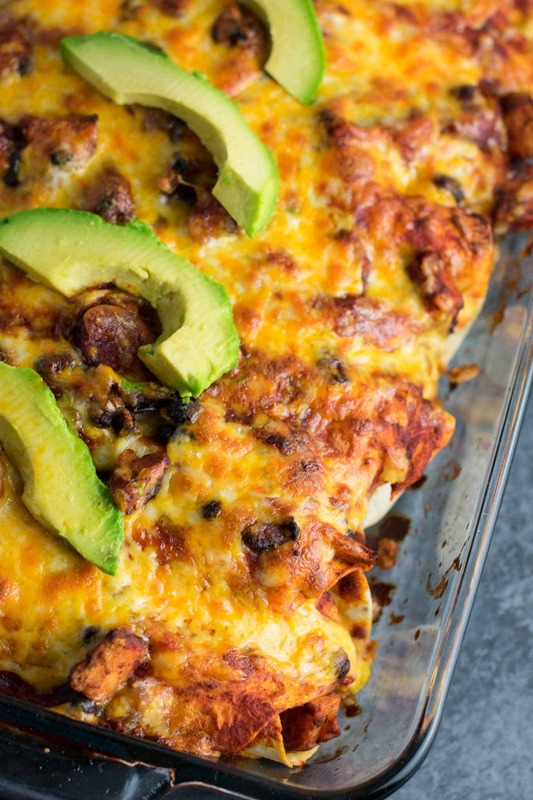 I decided to make another enchilada recipe and this time fill it with smoky sweet potatoes and black beans – a match made in heaven! 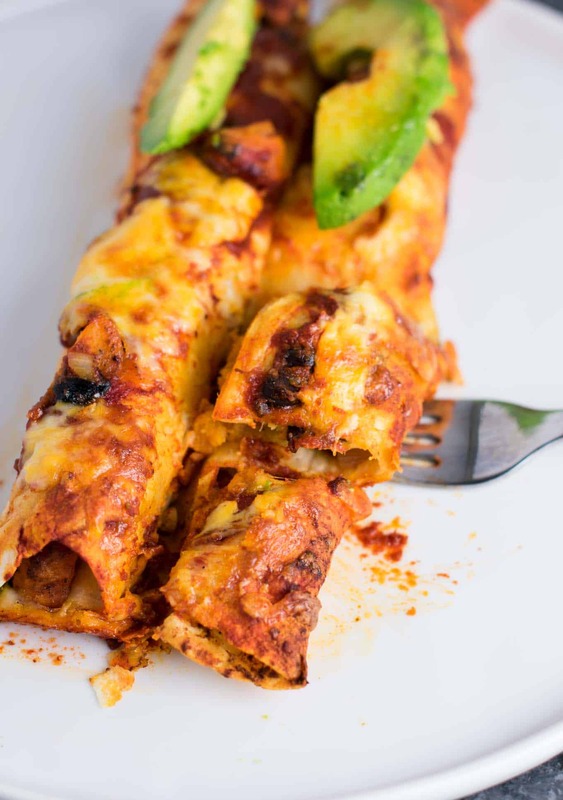 I love enchiladas because they are so simple to make but look impressive like you spent hours on dinner! Not to mention the taste – the crispy chewy edges and bites of smoky filling with creamy avocado and a hit of fresh lime. Pretty much everything I love about Mexican food! 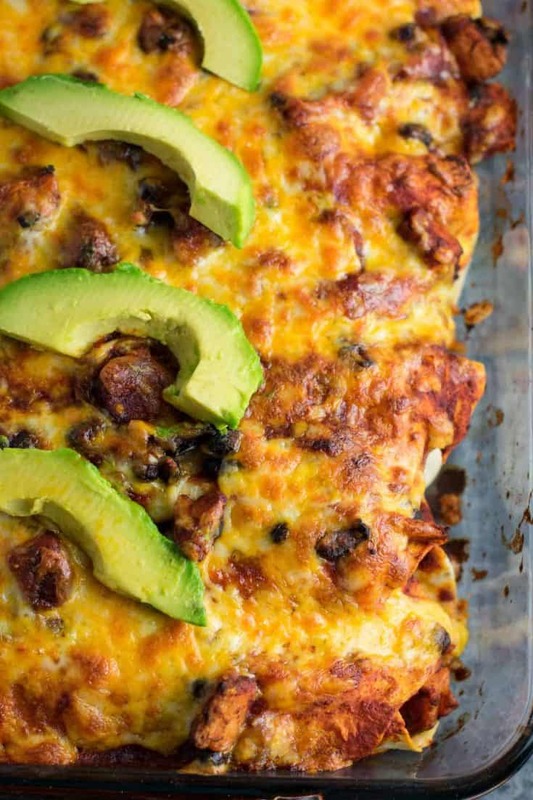 I used freshly grated colby jack cheese in this recipe and guysss it was amazing. Seriously took the flavor to the next level. I’m all about convenience, but it’s really worth it to take the time to grate the cheese yourself, you won’t be disappointed! I used my easy roasted sweet potatoes in the filling. I’m a big sweet potato lover lately, but I don’t love waiting an hour before I can eat it. These sweet potatoes cook in just 20-25 minutes and are ready to be mixed with the other ingredients of the filling. Once you roll ’em all up, simply top with enchilada sauce, the remaining filling, and the colby jack cheese. While toppings are usually optional, I HIGHLY recommend avocado and fresh lime squeezed on top when you serve them. The creamy avocado is the perfect contrast to the smoky filling, and the fresh lime really makes all of the flavors pop in your mouth. 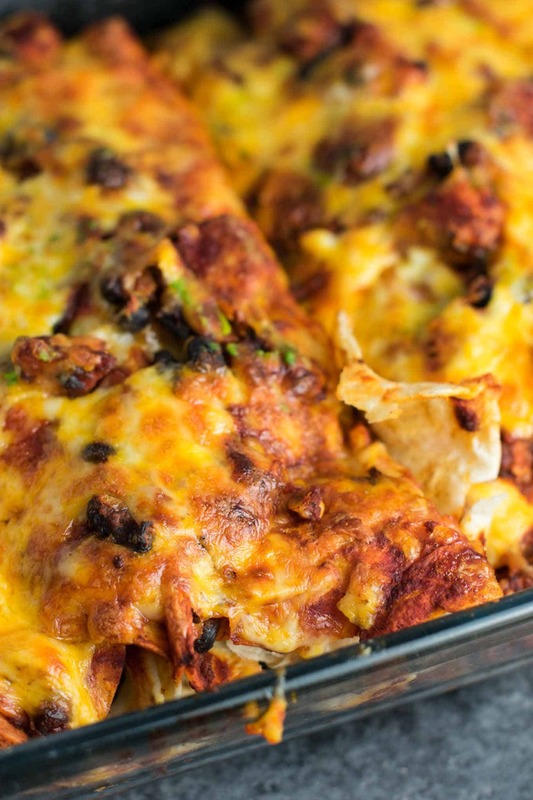 It’s really the perfect way to eat an enchilada in my opinion! These were even better (if that’s possible) the next day for lunch. The flavors really had a chance to marinate and it tasted incredible! If you’ve never tried black beans + sweet potatoes you are missing out! This recipe will easily serve 4-5 people. I guarantee it will even please any meat eaters! 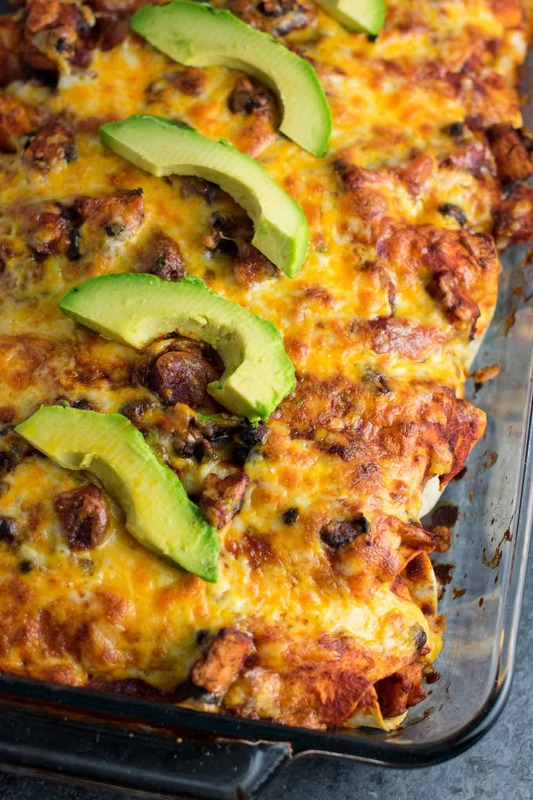 Smoky Sweet potato black bean enchiladas recipe. 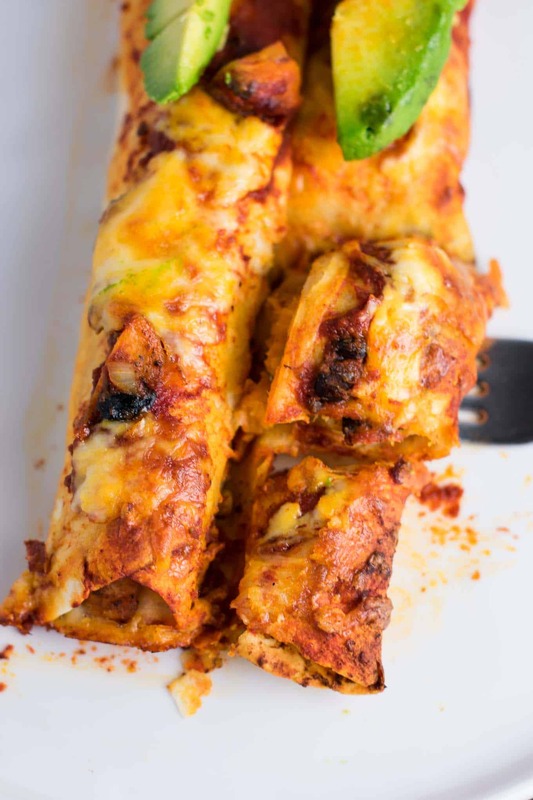 Even meat eaters will flip for these delicious enchiladas covered in sauce and freshly grated Colby jack. 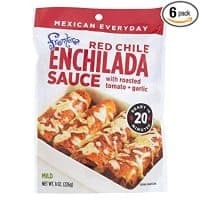 Hey, how do you make the enchilada sauce? or where can I buy some? I just buy mine at the grocery store! It should be in the mexican aisle. I love frontera brand! Hi! I am so excited to try this recipe for a Holiday dinner this week! it looks DELISH. Curious, do you think I could assemble a day ahead and refrigerate? I hope you enjoy the recipe! I wouldn’t recommend assembling ahead of time, as the enchiladas may get soggy. 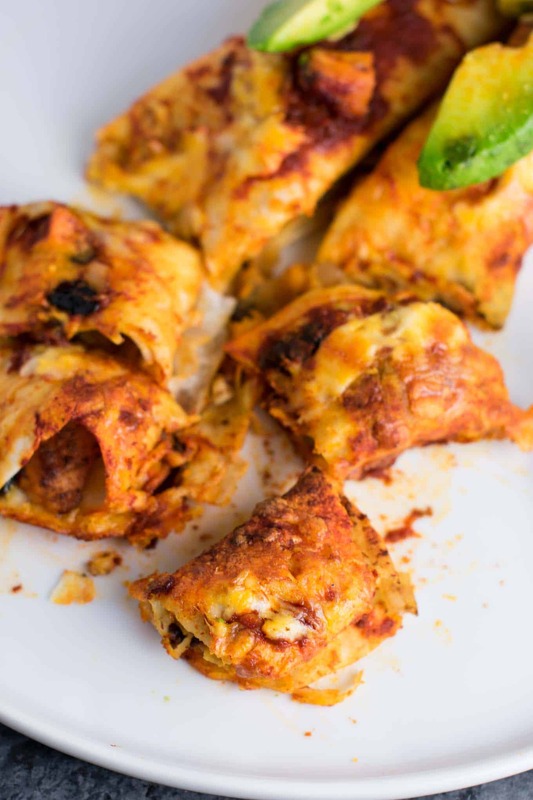 What you could do the day before is prepare the filling and put it in the fridge, then all you would have to do the day of is stuff and roll the tortillas and put the sauce + cheese on top. Hope that helps! Hello! I just wanted to tell you I made these last night and they were delicious! I did ad some fresh spinach and some pepper flakes for some heat. I totally agree that fresh grated cheese and avocado with lotsa lime make the dish! Thanks so much for the recipe, it’s a keeper! I’m so glad you enjoyed the recipe Cj! Made these for dinner and my whole family loved it! It was excellent and I highly recommend it!! So glad your family loved the recipe! Looks amazing! Do you use corn or flour tortillas? I use flour tortillas! I find them easier to roll up.